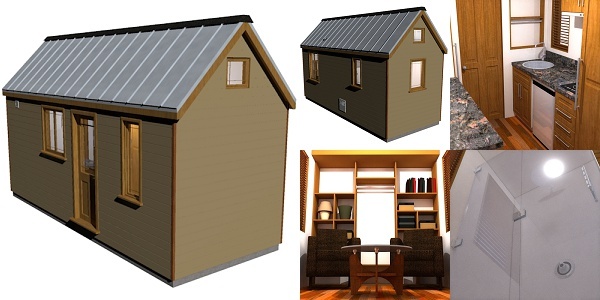 Our largest tiny house design at 226 square feet. And contains a spacious living and dining area, kitchen, bathroom and sleeping loft. The Humblebee is, at current, our only side entrance home, and at a total of 226 square feet, it is also our largest. It contains a spacious living area naturally lit by several large operable windows and leads directly into the kitchen. The kitchen has a dining table/counter space (with built-in storage beneath), sink, refrigerator, two-burner cook-top and two pull-out pantry’s for all your storage needs. The Humblebee includes a 3′ wide bathroom (great for those who prefer a little more elbow room), and like all our homes can be fitted with a variety of toilet and shower set ups. The loft is easily able to accommodate a queen sized mattress, with space to spare and has a cosy picture window.